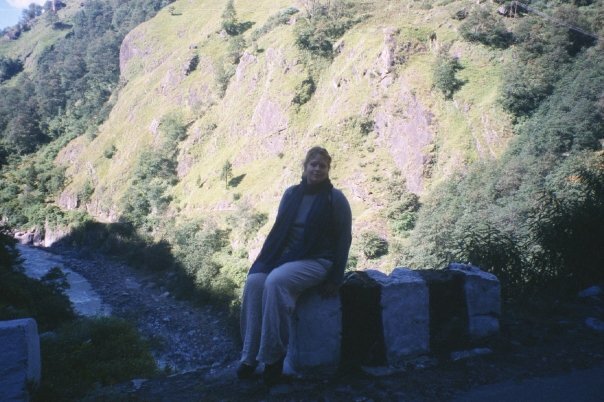 When I was 20 (that was in 1999) I had an amazing, life altering journey to India. To this day some of my most vivid memories are of those 5 weeks (and the 10 days I spent in Europe hanging out with a boy I kind of loved.) India is a place that captures you, through mystery, magic, food and for me fear. Those days spent in the mountains forever changed me, and I remain spellbound, for it was in India that I had my first encounter with the Lord, it was in India that he made his intention to pursue me clear. That is a story for another day, but I will say that in the midst of gods and idols, the One true God revealed himself to me! I got a glimmer of the Kingdom ya’ll. So yes, my love for India is deep and complex, and most easily relived through food. There is so much richness to the cuisine, from the care of preparation to the depth and texture of the spice, this food is comfort to me on both a spiritual and physical level. I love cooking Indian dinners for friends as it is such a true expression not only of how much I love to cook, but how much I love to share beautiful food and fellowship with friends. My friend Brittany recently spent 6 months in India and she mentioned that she would like to learn how to prepare more Indian dishes. I offered to teach her and in this offer I got the chance to meet some new lovely friends and share my testimony!! It was a blessed and wonderful night of eating, eating some more and talking about Jesus! Added bonus: someone else did the dishes!!! WIN!! I wanted to share the recipes of the night, they are not specifically any kind of diet. They are just lovely dishes, that taste amazing! Heat oil in saucepan and sauté chopped onion until lightly carmelized. Add cumin seed, cardamom, cinnamon, bay leaves, cloves, ginger, garlic, tomato and black pepper. Saute for about 30 seconds. Add spinach. Add sauté until starting to wilt. Add salt, cumin, turmeric, coriander powder and garam masala. Mix well with spinach. 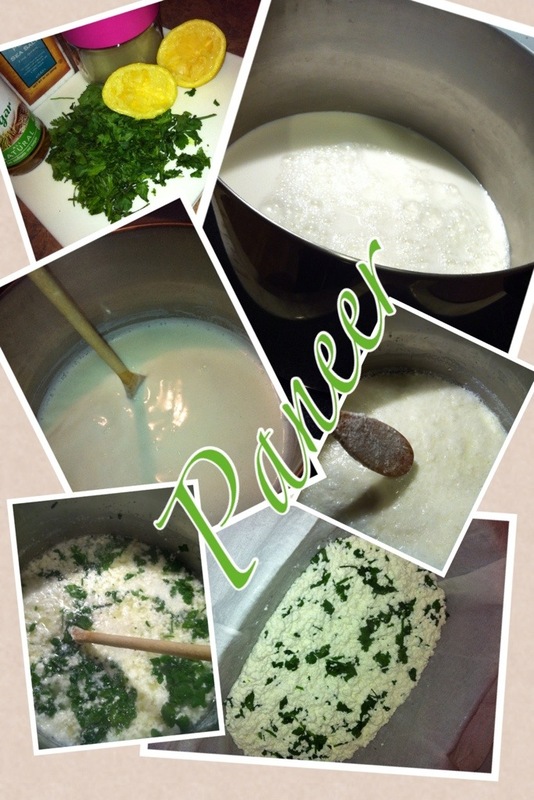 Add cream, tomato paste cilantro and cubed paneer. Cook over med heat until thickened. Stir so it doesn’t scorch. When cream reaches boil, dish is ready to serve! It’s so delicious!! Serve with rice, naan, or if you are paleo than cauliflower rice would be amazing! The process for making paneer is quite simple, although attention to detail is critical if you want the best possible flavor. Allot yourself about 45 minutes where you don’t need to walk away from the stove. Pour your gallon of milk into your very large stock pot and begin to heat on medium-high. Stir. Constantly. Pay special attention to the milk, or it will scorch and then your cheese will taste like scorch. Stir until the milk comes to a gentle boil. Also if you don’t stir all the cream will rise to the top and your texture will be off. Once the milk has come to a boil turn off the heat and add the lemon juice + 2 T of rice wine vinegar. Continue to stir and be amazed at the magic. It may take a minute or two so be patient and keep stirring. You can add additional vinegar if it’s not happening fast enough. This is why I use a mild flavored one, fyi. A very obvious separation will occur. The fat globules will rise to the top and the pull away from the whey! It’s very sciencey! At this point add salt and chopped cilantro. Give it a final stir with that handy wooden spoon and pour into your cheesecloth/strainer set up! Gently shape the cheese and wrap in cheesecloth. I usually leave the package in the strainer over a plate in the refrigerator so it can continue to drain any additional liquid! Voila! 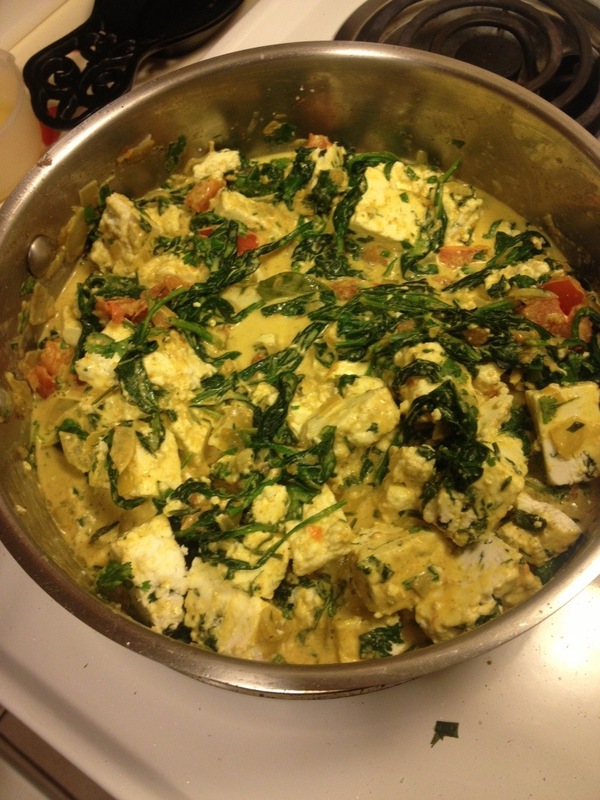 You made paneer/cheese. Now let it rest for 24 hours. It will keep for several days and you can cube it and fry it, or cube it and add it to curry dishes! It has awesome texture and adds such a unique flavor. Plus it makes me feel incredibly fancy whenever I make it! In large bowl stir salt and flour together. Add oil and mix together either with your hands or a fork. You are looking for a coarse breadcrumb texture. Slowly add water 1T at a time. Gather dough into a stiff ball. You may need to add additional oil and/or water to pull the dough together. That’s fine, just add small quantities and do it slowly! Once dough has pulled together into a stiff ball empty out onto a clean work surface and knead for about 10 minutes until it’s nice and smooth. Yeah baby! Make a ball, rub with additional oil and slip into a large ziplock or wrap with plastic wrap. The dough should not be sticky, it should be very smooth , then set aside for 30 minutes or so. You can also make this the day before. Once dough has rested you will roll it out thin and cut out 2-3 rounds, but while it’s resting….make the filling!! Over medium heat melt fat of choice, I like butter, once it’s melted and hot add onion, potato, apple, ginger and green chili. Cook for 7-8 minutes, until everything is nicely carmelized (but not burnt! Watch your heat, and keep everything moving!) – add ¼ cup water (or stock) and continue cooking. Add peas, cilantro, coriander, garam masala, cumin, cayenne and lemon juice. Season with salt to taste. Continue cooking (add liquid in small amounts as needed) until potatoes are quite soft and mixture is dry. Remove from heat and allow to cool. Now the fun part! Roll out dough and cut out 2-3 inch rounds. Add a scoop of filling to the center of each round. Fold dough over, like a little pie and crimp the edges with a fork. Use a little bit of water on your fingertip to act as glue! Once it’s assembled, finish the rest and get ready to fry! Heat oil, if it starts to smoke….it’s too hot. I usually add a tiny dough ball and if it sizzles, the oil is ready. 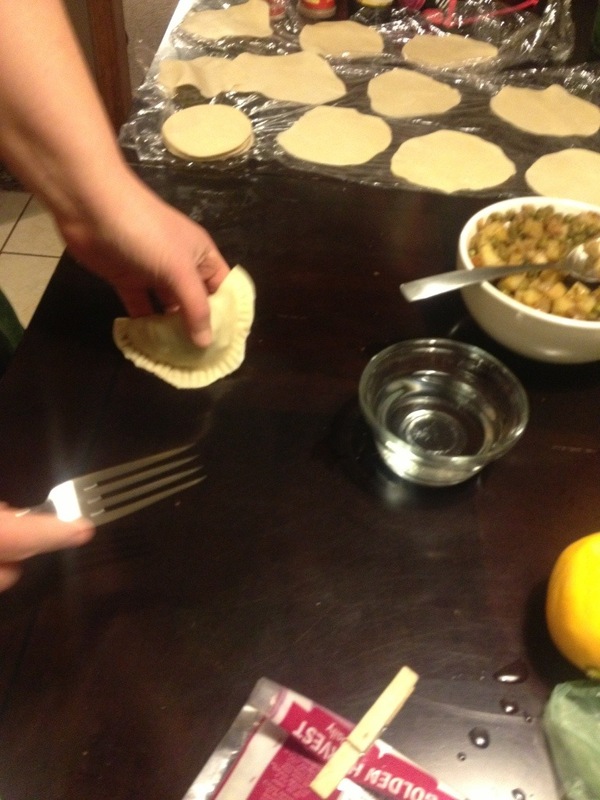 Add samosas…depending on the size of your fry pan you will probably need to do them in batches. Try not to overcrowd. Fry on each side until golden brown. 2-3 minutes per side. Remove from oil and set each batch aside until all are done. You may need to add additional oil or adjust your heat throughout this process. Cooking isn’t always easy ya’ll. You must pay attention! I usually move them to a cookie sheet and keep them in a warm oven (225) until they are all ready to serve! Serve with mango chutney, cucumber raita or eat them for breakfast! I won’t judge! Mango Chutney plus a recipe for Ghee….which is really just clarified butter that you cook a bit! I like this recipe it’s quite simple and delicious, it’s an adaptation of a Tyler Florence (who I met! He’s really short!) recipe called Sweet Mango Chutney. There is a more traditional method to make chutney, but I find this one makes me happy! Heat the ghee in a skillet over medium heat. Add the onion and ginger and cook for 1 minute. Add the mango, raisins, sugar, rice wine vinegar, and curry powder. Season with salt and pepper, reduce the heat to low, and cook until everything is soft and the flavors have blended, about 30 minutes. Put the chutney into a bowl and allow it to cool before serving. 1. Put the butter in a heavy saucepan over medium-low heat. 2. Melt the butter slowly and make sure it does not sizzle or brown. 3. Increase the heat and bring the butter to a boil. When the surface is covered with foam, stir gently and reduce the heat to the lowest possible setting. 4. Gently simmer, uncovered, and undisturbed for 45 minutes, until the milk solids in the bottom of the pan have turned golden brown and the butter on top is transparent. 5.Strain the ghee through a sieve lined with several layers of cheesecloth. The ghee should be perfectly clear and smell nutty; pour into a glass jar and seal tightly. Mix all of those things together in a bowl. Eat. Use as a dipping sauce, salsa, stir into everything else! Whew! That was a lot of recipes to transcribe! A few more recommendations….if I may? 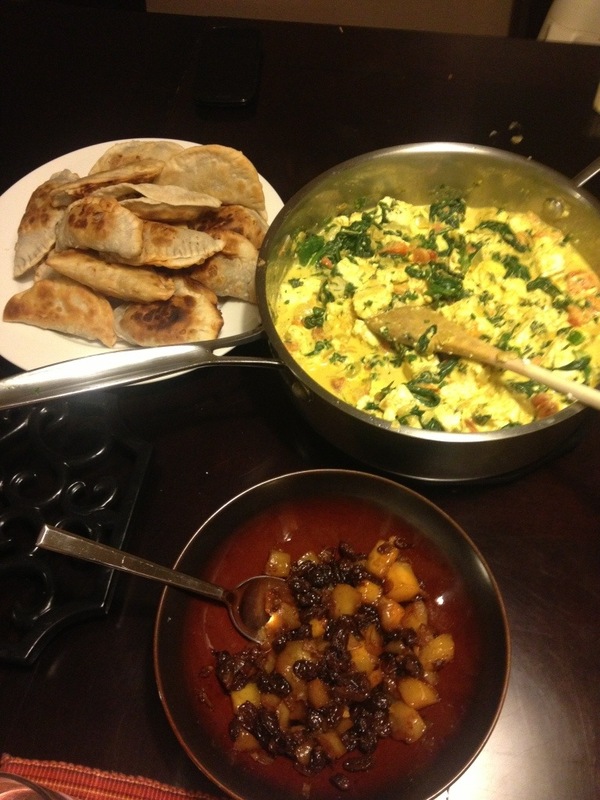 Invite friends to help you make Indian food! It is a considerable amount of work, but in my opinion so worth it. 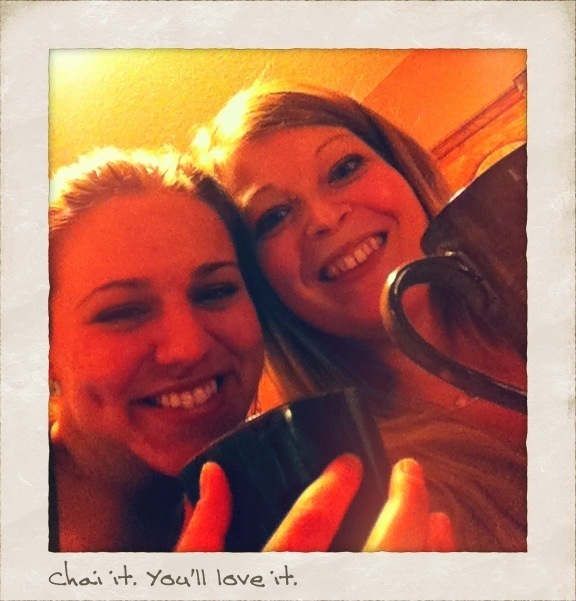 Also, have a chai off. It’s worth it! That’s where you and a friend of your choice talk an incredible amount of “smack” about who makes better chai, then allow other person to actually make the chai so you can sit and enjoy it while they do all the work!! God is so real, and he really saved me from darkness. I am undone just thinking about how much I love him, and when I think about how long he pursued my heart…..wow, I should I could turn this blog post into a book.